Ski season will be over before we know it, which means more availability to work a few home projects. One such project we recommend as the season changes is an electrical checkup to ensure your plugs, outlets, wiring and circuit breakers are in tip-top condition. Afterall, your electrical systems are some the most important elements of a safe home. We’ve created this simple checklist so you can double check your systems quickly, then get back to what we enjoy the most about Colorado, playing outside! Take a few moments to inspect all facets of your home. How is the condition of your roof and gutters? Are there any cracks in the foundation or walls? Is your chimney straight and whole with no missing bricks or mortar? How about the windows and doors? Frames should be intact, with joints caulked and there should be no broken glass or screens. Do you see any standing water in the yard? Are there any tree branches touching the roof or siding? Are they threatening wires or power lines? If they are, call a tree service to safely trim back branches. How does the siding or paint look? Check your outdoor electrical features. The main safety concerns when it comes to outdoor circuits and equipment are moisture and corrosion, issues related to underground burial and physical damage. If you’re not confident in your DIY inspection, you can easily hire a professional who can do a thorough walkthrough and recommend any repairs that need to be done. Now that you’ve inspected the outside of the home. Start in the laundry room. A laundry room needs at least one 20-amp circuit for receptacles serving laundry equipment; this circuit can supply a clothes washer or a gas dryer. Check those connections. If you have a sump pump, check that it is in working order. Do you have an attic fan? If so, is it properly functioning? 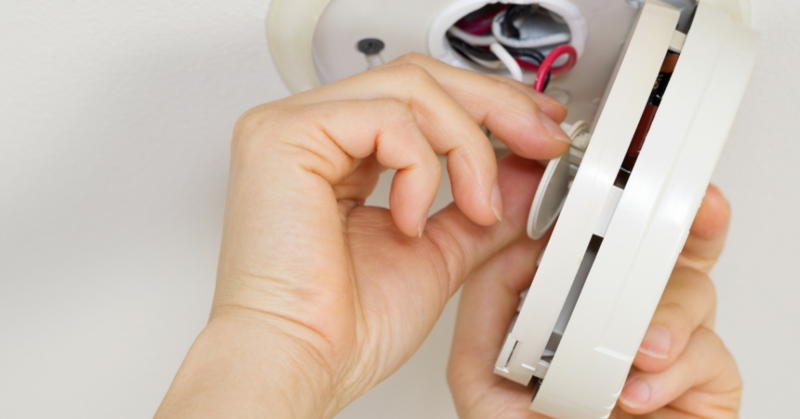 When did you last replace batteries for your carbon monoxide and smoke detectors? Have you tested them recently? Test any GFCI (Ground Fault Circuit Interrupter) outlets, these are often found in the kitchen and bathroom, or any place near a water source. These types of outlets are designed to protect you from severe (or fatal) electric shocks. Deep clean your filter by giving it a chemical rinse. Check your jets. Are they clogged or frozen? Have your spa water checked by a professional. With access to more advanced testing equipment, professionals can quickly and easily help you solve water quality issues before they create a disaster. Learn more about our hot tub services here. This is not an exhaustive list for electrical home maintenance this spring. If something doesn’t seem quite right or you’re unsure if your electrical system is truly working, contact your local electrician at Front Range Electric. We love to help all of our clients in the Colorado Springs area have an electrical system that they can rely on and, quite frankly, will forget about because it is working so well. Visit our website to learn more about us and to speak to one of our electricians.